Here I am with Scuba Drew in the middle of the North Pacific Gyre on a research boat checking out this gigantic pile of plastic that's polluting the ocean. And I mean GIGANTIC----it's the size of Texas and another Texas. Scuba Drew is the videographer documenting the trip. Make sure you are disposing of your waste properly. Always recycle if possible----and that means everything, otherwise this pile will just get bigger and bigger. Am I Fashionable or What? This is my favorite outfit so far!! Don't I look handsome and ready for an undersea adventure? Scuba Drew really knows how to dress me up! I'm ready for action!! 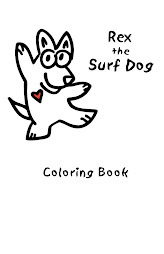 Scuba Drew read to me every day while venturing into the North Pacific Gyre. Reading is what I love to do each day for at least half an hour. I know I'm getting smarter and smarter. I know I am! What a party there was today! Costumes for children and pets! A parade led by a miniature painted pony! And all the farmers were out in full force with their locally grown produce at the Haleiwa Farmer's Market. Here I am sitting on a bale of hay at the market! Why you'd think I was on the Mainland! This Mom and son were taking care of the miniature pony, Elvis, who was giving children buggy rides around the Market. Big Wave Tomatoes are the Best!! Jeanne Vana makes the best pizza in the world! Promise! She grows her own basil and makes pesto for the crust and her homegrown ripe, ripe, ripe tomatoes are on top. YUMMMMMMMM!! Luann had lots to offer. I loved the juice in the exquisite glass container. Her organic eggs are always a sellout! 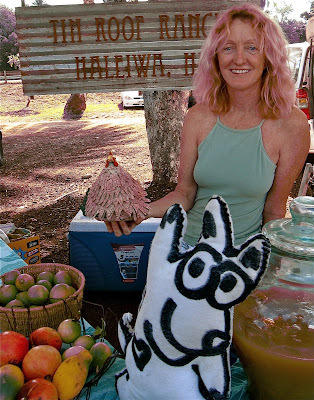 Bridget is a renowned chef on the North Shore and she's at the Haleiwa Farmers' Market every Sunday making the best breakfast burritos you'll ever eat! Tom is helping her by stirring the eggs and David, with his back to the camera, is taking care of all the customers. Ann was just setting out her outstanding orchids as I was dashing around having my photo taken. 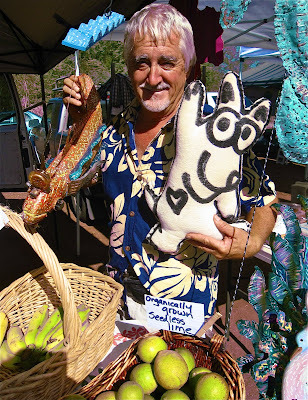 The Haleiwa Farmers' Market is open from 9:00 to 1:00 every Sunday. The tents are set up along Kamehameha Highway at the Sunset end of town. Griffin was explaining to a customer how to prepare a certain dish using some of his produce. That's his wife, Sakhone, working right along side him. That's how it is back at the farm too! These three twenty-year olds have their farm in Waialua. Doesn't that asparagus look yummy! Just steam it a bit and drizzle a little olive oil mixed with a touch of melted butter and take a bite of heaven that's healthy! Bernie Moriaz lives about 10 minutes away from the Haleiwa Farmers' Market and brought some fruit and vegetables to sell. The blood oranges were bliss! 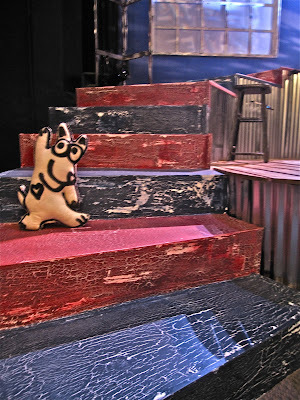 He's famous for his recycled art and oil paintings too! Two dogs in costume. What do you think--the Boxer or the Ballerina? 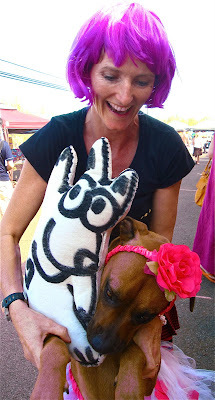 Marlu's Boxer is a therapy dog. Well, did you make a decision? I think it's a tie! Who's Behind that Big, Red Nose? Did you make a guess? It's Harley. He was at the Market vying for the top costume. I think he was a winner! He was, in my heart------I love clowns! How about a Spooky Story or Two? 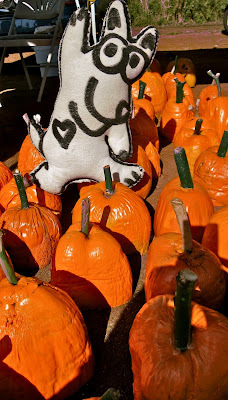 Janie came to the Market just for the Halloween Party. Isn't she dazzling in her cheongsam and face paint? She spent the morning wowing the youngsters reading Mom's favorite--POPCORN. Aren't those three little girls mesmerized? 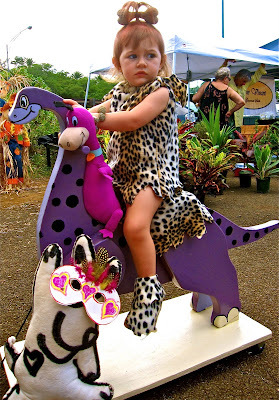 Cheynne, also known as "Pebbles", was riding in style on her very own pull toy------Dino! Her Mom designed and made her costume as well as her vehicle! Pretty cool, huh? 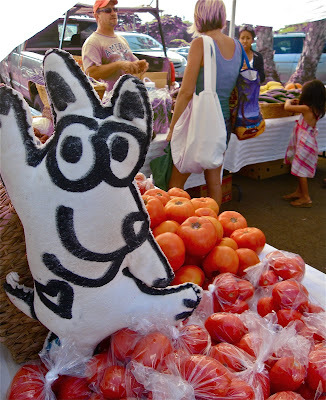 What a fun morning I had at the Haleiwa Farmers' Market. Join me there every Sunday morning. I'll be at the Keiki Korner ready to an arts and craft project with you for free! I love the colors of fall!! Even though the seasons on the Mainland are different---more extreme---there are changes in Hawaii. The surf is coming up on the North Shore, and, in a few months, the leaves will fall off all the monkey pod trees that live close to the beach out here. The salt spray from giant waves will defoliate them. I'm in Waikiki at a big beach kick off for "Make a Difference Day." These kids are stars on the first eco-conscious television network in the nation------The Green Channel. Their show is called "Opalavision". 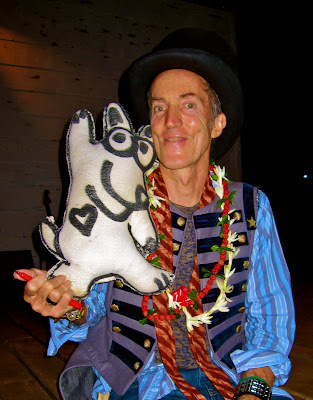 Go to: opala.org and see what's up! ("Opala" means garbage in Hawaiian). Jon is the producer of "The Green Channel" for Oceanic Time Warner Cable. HIs goal is to make islanders more aware and responsible for the stewardship of their home out in the middle of the Pacific Ocean. Those recycling containers are standard for most Hawaii residents. There are three----one for green waste, one for recycling, and one, that's out of the picture, for "true" garbage that will go to a landfill. Bravo, Jon! Amy Hanaiali'i was one of the entertainers who performed for the premier of The Green Channel. She rocked on with Kapono who has always supported recycling and taking better care of our islands. 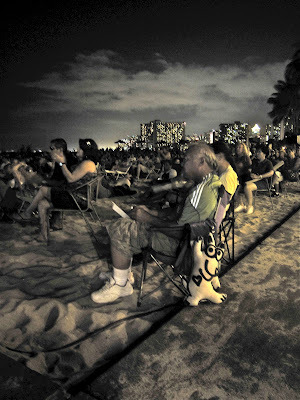 I'm leaning against Vance's beach chair on Waikiki Beach listening to music. Isn't it breathtaking, and remember, there are many on the Mainland who are shoveling snow right now instead of wiggling their toes in the sand. Vance flew over from Maui just for the concert and the "kau kau" which means "food" in Hawaiian. 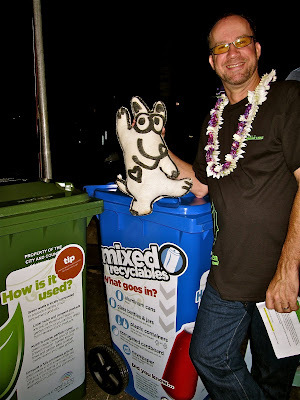 This free event was sponsored by the City and County of Honolulu to make folks more aware of the benefits of recycling. Good job! I'm waiting on the set for "Stripes and Stars" to begin at the Tenney Theater at St. Andrew's Cathedral. It's the first HTY performance of the season. This one-man show was written by James McCarthy. He's also the star! I'm so happy being hugged by James McCarthy. He just finished his exciting performance in "Stripes and Stars". He sang and told stories and made U.S. history exciting and fun! Please come and see him on stage. You will love the production! Go to: www.hty.web.org and buy your tickets! Namika, in the bikini, and Ezra, holding me, are competitors at the famous children's surfing contest in my beach town, Haleiwa. Jeff, on the left, is the Surf Team Manager for "Rusty". Mahina is being coached by him. Jason runs a new free magazine on Oahu with six friends called "Contracts". He's also a photographer and champion surfer. He just won a contest in Japan! John John was at the Menehune to cheer the competitors on. He competed here when he was a little kid. We had a long conversation and he explained the journey a surfer takes to become a professional and earn big prize money. 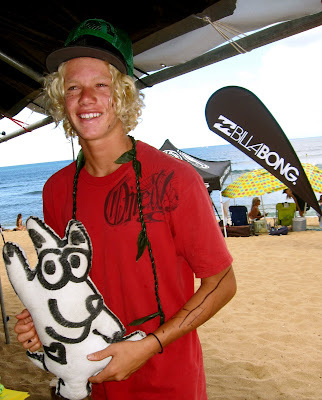 He's been competing around the world at WQS (World Qualifying Series) events. Just this year he has traveled to South Africa, the Maldives, Japan, Scotland, and South Africa. He's hoping to earn enough points so he can surf with the world's top 16 riders and compete in the World Championship Tour (WCT) contests and make a living as a "Surfing Professional". 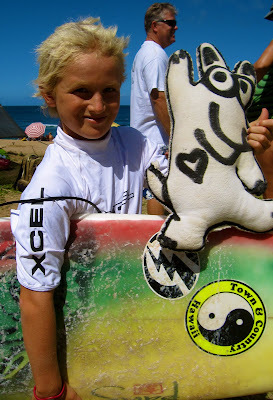 Dax just returned last month from California where she won the NSSA Contest in the Open Women's Division. She has won other national surfing contests too. Good luck competing in the Menehune! Rayne is hugging her dog, Dymond. 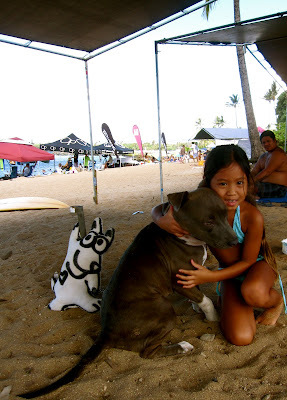 This pooch had her own tent at the Menehune Surfing Contest! Can you imagine that? That's Raymond, aka "Boogie", in the background watching over us. He volunteers as security and water patrol at the competition. Franco is another volunteer at the Menehune. This former educator takes photographs of the young wave riders and gives them the shots. Bravo to Franco. It's a two day contest and that's a lot of time to sit under a tent and snap pictures. Lana, a competitor in the Menehune, was being supported, as always, by her mom and dad, John and Morgan. They, as well as many, many North Shore families make a weekend of it at Alii Beach Park---setting up tents and bringing lots of healthy food. It's just one big party, but more like one BIG family reunion. Being part of this community really makes me happy! Who's Up? Who's Riding the Nose? 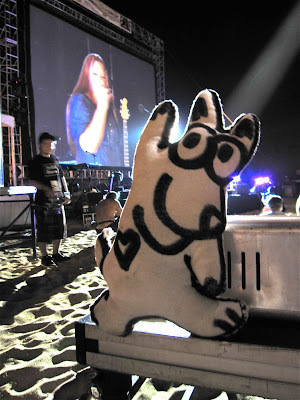 Dave, nicknamed "Dave Dog", was announcing at the Menehune. He'd just taken over for Rocky, the lifeguard, who had been on duty all morning. Heavenly and Namika, in her new contest t-shirt, were lending him a hand. Do you see all those children trying to catch the waves? The afternoon conditions were okay, but the wind had come up and was blowing a little too hard, making the surf choppy. Oh well, there's always another day to catch winter waves if you live on the North Shore of Oahu. Katrina, in the yellow, Myra, in the blue, and Jessica are beauty queens from Yakima High School in Washington. I had lunch nearby as they were having a meeting. I found out that to vie for a place in the contest, each girl had to be a good student, be a community volunteer, and have a way to change the world into a better place. "Wapato" means potato and the people of the area treat it special. Go California----------harness that free energy!! Still heading south to Los Angeles from Bend, Oregon, I followed these fire trucks for miles. They are the crews that look after the trees and wildlife in northern California should there be a fire. Did you notice they are not painted red! I was bowled over to see this mountain comin' up in the road. I'm still exhaling when I see this photo! What a spectacular view of Mount Lassen! Girlfriend and I were getting very excited. Mom had looked at the map and it looked a straight shot to Chico, California, but because it wasn't a map that showed the topography (surface elevations), it happened that we had to go over a pass at the eight thousand foot elevation of 11,000 foot+ Mt. Lassen, before we finally came down for the night at Kim and Paige's in Chico. What a beautiful day it was! This is the first time I have ever seen snow!! And here I am in the middle of a snowdrift in the middle of the summer. It's pretty cold on top of Mt Lassen. Anyone want to build a snowman? snowdog? snow bunny? This was just one of the breathtaking views I saw as I went over the mountain! I never put my little paws in that icy blue water, and "icy" being the operative word here! My pal, Girlfriend, and I just rocked back and forth as we sat in the backseat listening to the radio. We only have a few more days on the road-------Yes, our big Road Trip 2009 is almost over! What an adventure we've had so far! Barbara and Girlfriend and I are walking down the street in Hood River, Oregon, hungry for supper. She lives nearby in White Salmon, Washington, with her husband, Kent. Barb's a champion windsurfer! 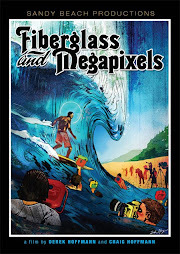 They catch waves all summer long on the Columbia River Gorge and head to Clearwater, Florida, for the winter. What a life! I spent the night up on the mountain at Barb and Kent's place. The next day I ate Mt. Ranier cherries off the trees. Heaven! I had just spied two deer whom, I think, had cherries on their minds, but got scared off by children's' voices. Later I stopped by a neighbor's house and was delighted to see this unique bird feeder! Very creative, don't you think? As I was taking a walk by Barb and Kent's place in White Salmon, I noticed some sleds that had been left behind. I think the local kids were sliding down the mountain on the golden grass. What do you think? These huge wind machines dot the hillsides all over California. They generate energy and it's nearly free------just let the wind blow the propellers and, PRESTO, electricity! As I was heading back towards southern California, I spent the night at the Red Lion Inn in Bend, Oregon. Next door was a great restaurant------the Black Bear Diner. Oh my, oh my, the pancakes were tasty! Stop by there sometime if you're in the area, AND get ready to see lots and lots of bear stuff!